An extremely powerful and fascinating legal thriller with brilliant writing and terrific characters and performances. 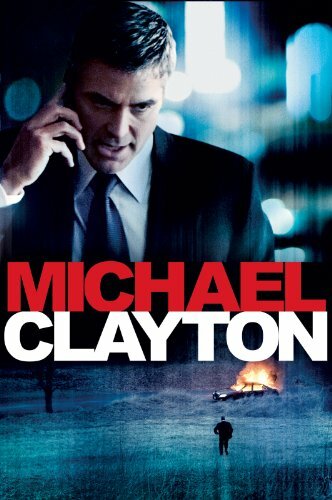 Michael Clayton is an artistic legal thriller, the likes of which we’ve really never seen before. Legal thrillers generally tend to be about the courtroom, or about the action. John Grisham books made into movies, (The Firm, A Time To Kill, The Client,) pioneered the way for that in the nineties, and it hasn’t stopped since. But Michael Clayton is something different. It’s a movie that is more about the people and the writing than about the action. This is a rich tapestry of a film, with some pretty brilliant dialogue executed to perfection. The movie opens with a voice-over monologue over a black screen, as Tom Wilkinson’s character, Arthur, goes on a rant about how his eyes have been opened. He speaks of how he has emerged from the darkness, to be reborn and ready to take on the system. The vocabulary and word choices he uses, as well as his enthusiasm and momentum, are all captivating. And this is only voice-over with a black screen. It’s before the movie has even opened. Now we cut to shots of a quiet office at night, all leading us into a busy board room of lawyers scrambling around and panicking over a merger. And then there’s the phone call between Marty Bach (Sydney Pollack) and a reporter, where she threatens him and he turns it right around on her. And all this is before we’ve even met our star, or learned anything significant about the plot. Not long after this, we do meet Clayton (George Clooney,) in what is possibly Clooney’s best role, (it’s either this or Out of Sight, and I’m going with this one.) Clayton is sitting down at a card table in an underground club. He leaves to take a job up in Westchester, involving a hit and run. Then he leaves that job, stops off in a field when he sees some horses, and watches in surprise, from the distance, as his car explodes. What an opening. This whole thing turns out to be a flash forward, and it all has a lot of meaning. First, the card game reveals some of Claytons back story about how he opened up a restaurant and it all went to hell and fell apart. He lost big, gambling on his junkie brother, Timmy. Another thing the flash forward does is give us a sense of what Clayton does for a job. He’s not a lawyer, per-se, but a fixer. He helps out clients of the firm (a lawsuit firm,) when they find themselves facing criminal charges. Just the nature of his job is something that is called into question a number of times, from lots of different characters, throughout this film. Finally, the explosion makes us want to know more. It seems unbelievable that Clayton would leave his car to go and pet horses, right? All of that will be explained later. Now we head into the present day story. We meet a woman named Karen, played by Tilda Swinton, who works for a company called U North. It’s a farming / environmental company, as we learn from a video which is all about what they do. We learn from a taped interview, about how she rose to power at the company, to become their head of legal representation. It’s a lot of back story and exposition. Maybe too much. But it all helps to fill in the missing pieces, flesh out the characters, and give us a better sense of the entire situation. That situation is one where Arthur, (a top lawyer and partner at Clayton’s firm,) who has been working the U North lawsuit case and defending them, has now had a change of heart. He knows U North is poisoning the water and he can’t sit idly by and defend them anymore. Not only that, but after meeting some the people hurt by what the company has done, (in particular, a young girl named Anna,) Arthur decides to make a case against U North. He’s turning on his client and becoming their enemy. Clayton is brought in to straighten Arthur out. He is sent in to get Arthur in another state and bring Arthur back home to New York, after the man has a public meltdown and starts stripping down and chasing after cars naked. Arthur escapes Clayton and goes back to New York himself, which only makes things worse. Staying in his apartment, a loft in Tribecca, Arthur records a message, going on a rant about how terrible U North is. The problem is that U North has hired a team to do surveillance on Arthur, which includes tapping his phones and all around his apartment. They hear the message that Arthur is leaving and spring into action. Everything seems like it might be okay, at this point, after U North steps in. Only something just isn’t sitting right for Clayton. Something about Arthurs situation doesn’t seem to make any sense, and so he calls in a favor with one of his brothers, (the cop, not the druggie,) and gets into Arthurs apartment looking for clues. This is where the movie turns into a bit of a mystery, and an unconventional one at that. Clayton discovers what Arthur is up to, and learns that maybe the man was right. Crazy in the way he went about handling things, with the stripping down and all, but still, on the right side of the morality fence. This movie works on so many levels. It’s more than a mystery and more than a thriller. It’s also a drama about a broken down man who has way too many pieces to put back together. Clayton has a son, (for some reason we never meet the ex-wife,) who he gives some powerful talks too. He has some great relationships with his brothers, and it’s pretty cool that we get to see each of them in at least two scenes, fitting them into the story inn such a way that they become relevant to the plot. What also works is the back story of Clayton owing money ton loan sharks, because of the restaurant and bar he opened, which didn’t work out. We get to see multiple scenes of him dealing with these guys, and none of them are the cliches we might expect, of bookies breaking fingers or beating people up. Instead, they are conversations, which are all the more menacing because off what we don’t see and have to imagine for ourselves. And then there are the situations related to U North and characters involved. It’s no coincidence that Tilda Swinton, Tom Wilkinson, and Clooney, himself, were all nominated for Oscars for this film. They are all at the top of their game here, and considering who these actors are, that’s saying a lot. Sydney Pollack is also pretty sensational as Clayton’s boss, Marty Back. He’s very much a supporting character, only in a handful of scenes, but with every one of them, he knocks it out of the park. And then there’s the way this movie works on so many different levels. There’s the Arthur – U North story, there’s the loan shark restaurant story, there’s the who is Clayton really story. Bach tells him he’s got a niche, and is something that everyone knows is valuable to the firm. His brother, the cop, tells him he’s got everyone fooled. All these lawyers think he’s a cop and all these cops think he’s a lawyer. Only Clayton, himself, knows the truth. This is excellent writing and some pretty smart stuff. It makes for a hell of a legal thriller and a very, artistic, yet edge of your seat, powerful movie.